Lisa Saunders, fifth-grade teacher from Bicentennial School in Nashua has been named NH Project Learning Tree Educator of the Year. She will receive the award at the NH Project Learning Tree Annual Celebration on May 8th. The celebration featuring Mary Holland, naturalist-photographer and author of the book and blog Naturally Curious will take place at the Puritan Conference Center in Manchester. Ms Holland is from Vermont and has an abiding passion for natural history and has taught in a variety of environmental programs. Her writings appear regularly in newspapers and magazine throughout the region. Tickets are $50.00 and can be purchased online at www.nhplt.org until May 1 or at the door. 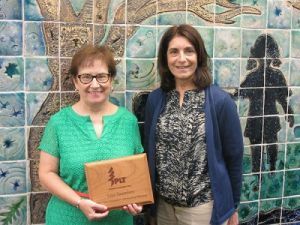 Lisa Saunders is receiving this award because she encourages students to connect to nature and their local environment. She understands and models the important role educators play in connecting kids to nature. As you walk into her classroom you will immediately see evidence of interactive environmental experiments in the form of water jugs, water samples and other inquiry-based activities. Her involvement with NH Project Learning Tree began over seven years ago while participating in a program called Connecting Schools to People and Place and continues with her involvement in a program on building vertical science literacy. Her love and commitment to science and the environment resonates in her personal life and makes her teaching genuine and realistic. Parents, students, and colleagues know Lisa as a dedicated, knowledgeable, and resourceful environmental educator. NH Project Learning Tree provides educational opportunities to enhance youth understanding, appreciation and love for the natural world. For information on the Annual Celebration visit www.nhplt.org. NH Project Learning Tree, an independent 501(c)3 organization.